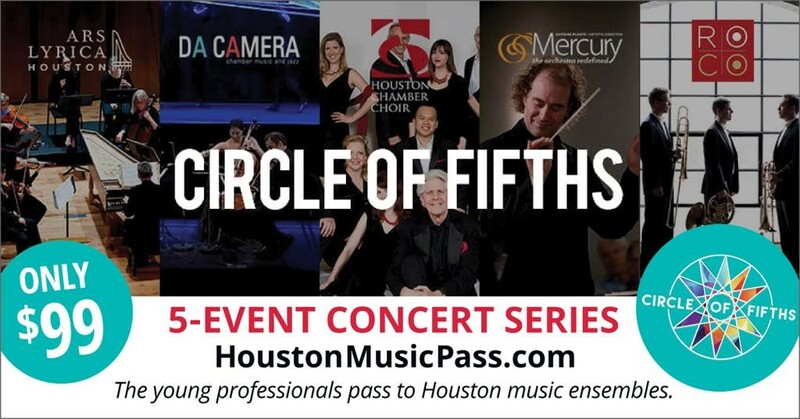 Circle of Fifths is a musical passport to Houston for young professionals. Experience the incredible artistry provided by Houston chamber music organizations. Enjoy performances from Houston’s premiere ensemble organizations: Ars Lyrica Houston, Houston Chamber Choir, ROCO, Mercury and Da Camera. The Circle of Fifths pass includes 5 great concerts for just $99, an invitation to the Circle of Fifths Kick-off event and other benefits. For more information, go to www.houstonmusicpass.com.